by amandab 9/11/2018 8:33:47 AM -- NORFOLK - A Northeast Community College student has started her freshman year by earning a national career and technical scholarship for students who have faced adversity. 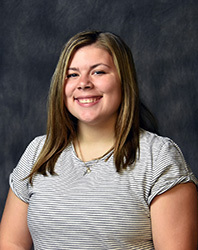 Emily Ellis, Pender, is one of 809 students nationally to receive the 2018 Horatio Alger Association Career & Technical Scholarship. Designed to assist students who have overcome challenges in their lives, the Horatio Alger Scholarship programs seek students who have demonstrated determination, integrity and perseverance as well as financial need. The organization honors over 1,800 scholars each year and has awarded approximately $125 million to approximately 20,000 since 1984. At Northeast, Ellis is a participant in the TRIO Student Support Services (TRIO/SSS) program, an academic assistance program funded through TRIO grants by the US Department of Education. It consists of eight programs targeted to serve and assist low-income individuals, first-generation college students and individuals with disabilities. TRIO/SSS offers its students individual support, personal support and academic support throughout their academic careers. Neeman said Ellis will be a welcome addition to the TRIO Program at Northeast. Ellis is earning her associate of applied science degree in early childhood education at Northeast.